Anastasia Pollard at the Classical Art Academy. Anastasia will be running a portrait workshop this summer at the Classical Art Academy in Southbourne, Bournemouth Dorset. Spaces are limited please contact for more information. Anastasia Pollard studied at Pennsylvania Academy of Fine Arts and Florence Academy of Art. Her work has been included in the annual exhibitions of the Royal Society of Portrait Painters and was previously included in the BP Portrait Award in 2006, 2007, 2009, 2012 & 2017. Pollard won The William Emlen Cresson Scholarship, Silvia & Miron M Walley Memorial Scholarship and was successful in the Linda Lee Alter Awards. 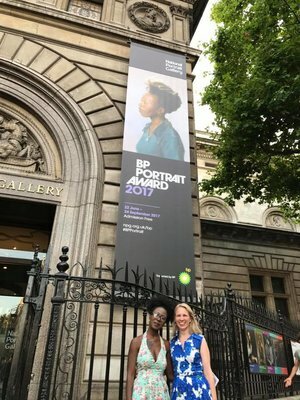 'Corrine' was selected for the BP Portrait Award 2017 and also to be featured on the main banner and front of the guide. Anastasia has been honoured to be selected to exhibit in the BP Portrait Awards in 2006, 2007, 2009, 2012 and 2017.